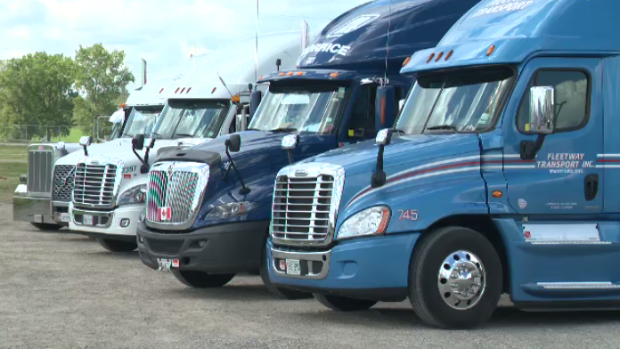 Trucks lined up for the 14th annual Truck Convoy for Special Olympics in Paris. The Paris Fairgrounds saw their 14th Truck Convoy for Special Olympics on Saturday. The convoy started in 2001 in Florida before it moved to Ontario. Since 2004, it has raised over $855,000. The money is used to support over 23,000 athletes in Ontario. “You can imagine the cost of sending coaches, flights, all those extra costs to do games,” said chairperson Tammy Blackwell. Next year, the world games are to be held in Dubai, and Blackwell estimated that over $50,000 would be raised during the day. Drivers sign up for $100 and then collect pledges. The lead truck is the driver who raised the most money—this year, they collected $7,000. The marquee event is the truck convoy, allowing athletes to ride along in the trucks. “You get to sit down in a big truck, you get to go and get to be on the road, you get to see what’s going on and passing all the cars, it’s amazing,” said Bryan Kleinsteber, a Special Olympic athlete. Lunch, awards, fundraising, draws, activities, and a truck pull were all part of the day as well. Special Olympics Worldwide will celebrate its 50th anniversary next year.